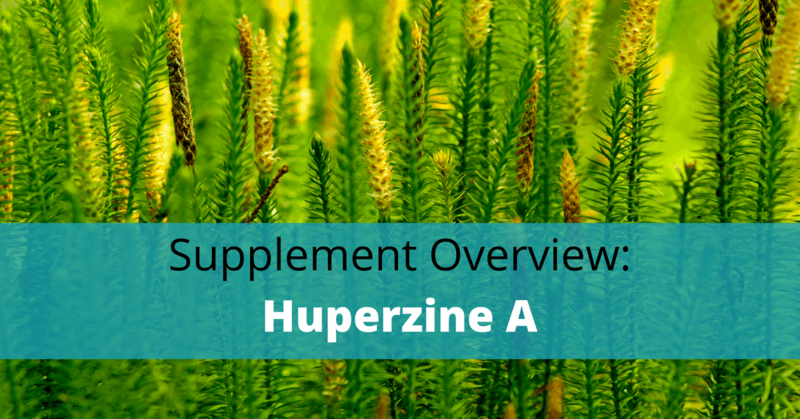 Huperzine-A, Huperzine A is a compound normally extracted from Huperzia serrata (club moss), a plant that is native to Southeast Asia. Club moss use can be traced back to the Tang dynasty in China when it was known as Chien Tseng Ta. It was used in treating colds, rheumatism, improving blood circulation, and for relaxing tendons and muscles. Huperzine-A is a specific, reversible, and potent enzyme acetylcholine esterase (ACHE) inhibitor known to break down acetylcholine. However, it also has additional brain-supporting effects 1 that don’t involve acetylcholine esterase. Although its structure is different from that of acetylcholine, Huperzine-A binds to ACHE. Its working is similar to that of drugs used in managing Alzheimer’s disease although with fewer side effects. Club moss has been used for many years in managing bruises, swelling, sprains, rheumatism, and colds, to relax muscles and tendons, and to improve blood circulation. Today, it is used for managing Alzheimer’s disease, learning and memory enhancement, and other memory impairments related to aging. It is also used for increasing energy and alertness, for treating muscle-related diseases, and as a guard against agents that can harm the nerves. Because it lacks adverse side effects, Huperzine-A is a good substitute for drugs commonly prescribed for the treatment of neurodegenerative diseases. By reducing NF-kB signaling activities, it helps with inflammation through inhibition of ACHE. Due to the genetic differences among people, Huperzine-A’s impact can vary. Huperzine-A supplementation is generally between 50 and 200mcg daily. You can divide this dose into multiple dosages taken throughout the day or take it as a single dose. Huperzine-A doesn’t need to be co-ingested with food to achieve the desired cognitive or physical enhancement. It can even be taken when you are fasting with the same results. When taken by mouth, WebMed recommends doses of between 50 and 200 mcg taken twice each day for AZ and vascular dementia. For senile or pre-senile dementia, the dose should be 30 mcg taken twice daily while for memory improvement in adolescents, it should be100 mcg—taken two times daily. When injected to prevent muscle weakness as result of myasthenia gravis 2, the healthcare providers will give a shot daily. Huperzine-A cycling is recommended because it can remain in your system for quite a while. The half-life of Huperzine-A is 10-14 hours, and a full ‘cycle’ can last between 2 and 4 weeks, typically followed by a break. As a memory supplement, Huperzine-A appears safe. Clinical research 3 indicates that it is more effective compared to other cholinesterase inhibitors like donepezil and tacrine. When taken orally, Huperzine-A gets absorbed rapidly and has an extremely slow dissociation rate from the enzyme as well as longer action duration. Regardless of your personal goal, it’s always good to start using Huperzine-A at the lowest possible dose. This accords you the window needed to assess the effects on your body and the tolerance levels. Most of the benefits associated with Huperzine-A arise from the acetylcholine-enhanced production. Not only is it a powerful nootropic 4 but it also a great choice for fitness enthusiasts and bodybuilders. The mood enhancing effects of Huperzine-A comes as result of the subsequent increase in the levels of dopamine and https://www.britannica.com/science/ norepinephrine. Let’s look at several key benefits and uses of Huperzine-A. Huperzine-A acts a brain protectant by performing a number of important functions that allow levels of acetylcholine to increase. Once the GABA receptors 5 are boosted, they begin shielding your brain from potential oxidative damage. Being an NMDA receptor antagonist, Huperzine-A prevents glutamate toxicity 6 from causing damage to your neurons. Gamma-Aminobutyric acid is known for over-stimulating NMDA receptors, in turn causing harm to neurons. Huperzine A prevents this type of impairment from occurring. Huperzine-A is commonly employed in treating Alzheimer’s disease as well as other neurodegenerative conditions and diseases. This is largely because of its capacity of enhancing cognitive and memory abilities, being a neuroprotectant. It is thought that Huperzine-A contributes significantly towards reducing the NF-kB pathway in the brain’s immune cells, suggesting that it could reduce inflammation levels, a useful input for those with Alzheimer’s. Alan A. Mazurek, M.D., a noted neurologist, conducted a trial in the US studying Huperzine -A’s efficacy and safety. The Researcher carried out the evaluation in an open-label study that involved 29 patients suffering from mild to moderate Alzheimer’s disease.75.9 percent (22 patients) completed the 3-month trial. Adverse effects were only reported by two patients, one is a case of seemingly unrelated hemorrhagic infarct which got resolved without resorting to treatment. No cardiac effects, gastrointestinal, nausea, headache or diarrhea side effects were reported. Dr. Mazurek reported that the improvements appeared to have a close relationship with the dose used. Those on higher dosages tended to exhibit the greatest improvement. The Alzheimer’s Association7 does not recommend taking Huperzine-A if you are on a prescribed cholinesterase inhibitor as combining the two could increase the risk of more severe side effects. Huperzine-A can decrease damage to cells due to oxidation 8. This is achieved through the role of Huperzine-A as a controller of the signaling pathways that manage oxidation and cell death. Animal studies have shown that Huperzine-A can offer protection against organophosphate (OP) intoxication as well as control glutamate-induced cell death. Both human and animal safety evaluations have also shown that it is devoid of any unexpected toxicity. Acetylcholinesterase inhibitors such as Huperzine-A might be effectively used in treating cocaine use disorder. One self-administration study 9 showed that it decreased a person’s perception of the cocaine effects, and could offer a safe way of treating substance addiction. This study represents an important contribution to the substance addiction field as it serves as the premier published report on Huperzine-A’s potential efficacy and safety as a method of treating cocaine use disorder. Taken for less than 3 months, Huperzine-A is relatively safe. If you have any significant underlying medical condition, it is recommended that you consult with a physician prior to using Huperzine-A. The most commonly reported side effects associated with Huperzine-A are diarrhea, nausea, vomiting, sweating, loss of appetite, slurred speech, blurred vision, twitching, restlessness, cramping, contraction of muscles, urinary incontinence, slowed heart rate, and high blood pressure. In other clinical trials, a number of adverse Huperzine-A reactions have been observed. Besides the common ones mentioned above, others include water retention, constipation, nasal obstruction, anxiety, insomnia, dizziness, hyperactivity, and thirst. Using Huperzine-A has been known to trigger nasal respiratory obstruction that can potentially cause difficulty and discomfort when breathing. Individuals who have been diagnosed with vertigo, kidney disorder, asthma, a seizure disorder, emphysema, liver disease, GI obstruction, or urinary tract blockage are advised to first consult with a physician before beginning Huperzine-A supplementation as it could have adverse reactions to treatments or other prescription medications. Some of the GI side effects associated with using Huperzine-A include constipation and diarrhea while some people have experienced unusual thirst levels and vomiting. One clinical trial indicated electrocardiogram pattern abnormalities like cardiac arrhythmia and ischemia. This doesn’t come as a surprise considering that the usage of Huperzine-A can affect motor neuron signals transmission 10. In addition, when taken with beta-blockers, Huperzine-A could decrease your heart rate. If used in doses higher than recommended, Huperzine-A is potentially toxic. The same can be a concern in case your system already has too much acetylcholine. Huperzine-A can be taken in several ways. Perhaps the best thing about this nootropic is that it is completely water soluble. This means that it can be dissolved in a glass of juice or water. It is also available as tablets of between 50 and 200 mcg. Another great thing about it is that you don’t have to take it alongside any food. To mask what at times can be a bitter taste, you can try taking Huperzine-A in a dissolved state in a juice. Avoid taking Huperzine-A just before going to bed as it is known for producing mental energy that could end up keeping you up all night. People who are already on AZ prescription drugs 11 such as Razadyne, Exelon, or Aricept should not use Huperzine-A supplements without the approval of a physician. Other contraindications to Huperzine are yet to be comprehensively identified and documented. There are many nootropic supplements available today that can act as an alternative to Huperzine-A, each coming with its unique brain action mechanism. Here are two good ones. Used alone, this supplementation could possibly boost memory if the user happens to be deficient in choline. This is because Huperzine-A only works by preserving the levels of acetylcholine already in your system. You can buy choline supplements 12 to make sure that your brain has ample supply to operate optimally when it needs GABA function boosting. The recommended dosage is 500mg once daily. Another viable alternative is Noopept . It works as a GABA neurotransmitter13, improving learning ability and memory through stimulating your NMDA and AMPA receptors as well as their pathways that are useful in the creation and storage of memory. This is particularly good for students or individuals working in an information-intensive career. The recommended dosage is 30mg once daily. While Huperzine-A has an effect when used alone, when stacked with the right ingredients, it has the potential of achieving even better results. When taken together with a choline source like Alpha GPC, Huperzine-A can boost acetylcholine levels in the brain even further, thus enhancing its effect. The diets of many individuals are choline-deficient, and supplementation can be useful. A number of ready-made nootropic stacks already have Huperzine-A within their formula. Racetams are GABA supplements that make an excellent choice for Huperzine-A stacking. Racetams are believed to activate glutamate receptors located near your acetylcholine receptors. This sensitizes your acetylcholine receptors to become activated. Using a Racetam to sensitize the receptors and increasing acetylcholine levels with Huperzine-A enhances the combined nootropic effect of the two drugs. Often, Huperzine-A is paired with Noopept, a popular and powerful nootropic.Other nootropics that can be stacked with Huperzine-A include Vinpocetine, Fish Oil, Alpha GPC, Acetyl-L-Carnitine or Phosphatidylserine supplements. It has been suggested that green tea may boost the effect of Huperzine-A14. A key benefit of using green tea or polyphenol epigallocatechin-3-gallate (or EGCG), is that it brings some feeling of relief. If pregnant or nursing, there is a dearth of reliable information regarding the safety of using Huperzine-A. To be safe, it’s best to avoid using it altogether. Huperzine-A could slow down your heart rate. This can be a problem if already you have a slow heart rate or if you are suffering from other types of heart conditions that involve the heart rate. Huperzine-A should, therefore, be used cautiously in case you have any heart disease. Because it appears to affect the composition and functioning of brain chemicals, experts caution that it could worsen epilepsy, and it should, therefore, be used cautiously in case you have any form of seizure disorders. There is some concern that the usage of Huperzine-A could make Gastrointestinal (GI) tract blockage worse because it may increase fluid and mucous secretions in your intestine leading to “congestion.” Therefore, in case you are suffering from gastrointestinal tract blockage, it’s recommended to first consult a healthcare provider prior to using Huperzine A. Outside China, no controlled clinical trials on toxicity and efficacy assessments have been published yet 15. If you want your mental faculties in their sharpest forms as you perform information-intensive tasks, then you should consider using Huperzine-A. The cholinergic and anti-inflammatory of this nootropic make it an excellent supplement for brain repair if you have been suffering from AZ or other illnesses that affect the brain.Huperzine-A treatment is also known to significantly enhance cognition in patients suffering from Alzheimer’s disease and vascular dementia. Huperzine-A is an effective Nootropic substance whose action is similar to lots of other acetylcholinesterase inhibitors. It is known to possibly assist in boosting acetylcholine levels and could enhance cognition and memory. It is widely used as a natural supplement because of its nootropic effects in healthy individuals. It is relatively easy to buy Huperzine-A supplements wherever health supplements are being sold or online.